Sinhatech’s fuel cost saving product is the “Deturbulator” strip. It is a stick-on low profile aero-drag reducing device, which does not impede normal operation of the vehicle in any way. It reduces aero-drag through mitigating turbulence in airflows. This is an entirely new approach which relies on encasing an unstreamlined object within a turbulence free separated flow region. This can make a truck appear more streamlined to the airflow. Because of its low initial and replacement cost, and fairly significant fuel savings through aero-drag reduction the Deturbulator strip provides excellent value for long-distance trucks. Typically, the Deturbulator installation pays for itself through fuel savings within about 2-5 weeks and needs to be replaced about once a year. The main components consist of a flexible composite skin or membrane stretched across a substrate with ridges..A system of vents equalizes air pressure in the membrane-substrate gap with the air flowing over the Deturbulator. Sinhatech’s Deturbulator Strip incorporates these components within a replaceable slide in insert. The adhesive-backed receptacle, into which the insert slides it is stuck to the sides of the vehicle. 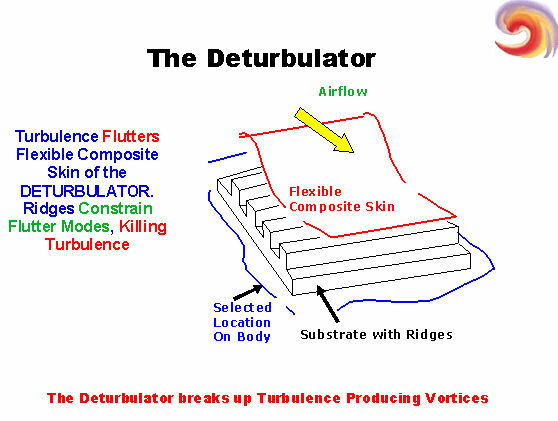 The Deturbulator coverts vortices responsible for generating turbulence into small scale vortices which naturally dissipate quickly. This short circuits turbulence production. In other words, turbulence is destroyed as soon as it forms. 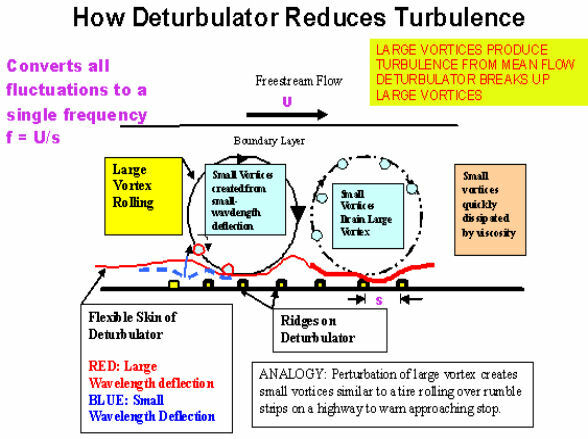 The large-scale turbulence producing vortices are similar to a rolling tire. The ridges on the substrate act like rumble strips. These interrupt the long waves on the membrane. 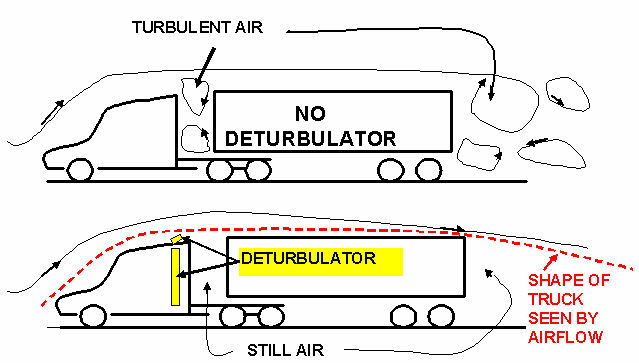 The vortices in the flow direct communicate with waves on the membrane provided the Deturbulator is located at the appropriate place on the vehicle or body. The optimum places or “sweet-spots” for locating the Deturbulator depend on the model and configuration. Contact Sinhatech for details. How Does the Deturbulator Reduce Drag of trucks and cars? The Aerodynamic Drag or air resistance is primarily due to turbulence in regions of separated flow. Flow separation occurs when flow over an object cannot follow the contour of the object and pulls away. Turbulence in the separated region destroys flow mechanical energy as heat. This causes a loss in static pressure. For separated flow behind a vehicle, this low pressure “holds back” the vehicle. This shows up as “form” or pressure drag. 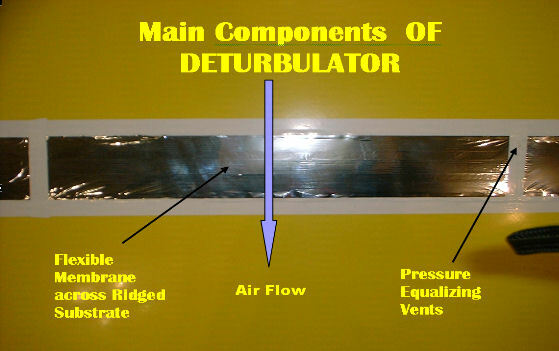 The Deturbulator converts these separated regions into almost stagnant air masses. Such air masses can behave as a virtual boat-tail and make the vehicle appear more streamlined to the flow. How much fuel can the Deturbulator save for operational trucks? Has SAE/TMC standard fuel economy tests been performed on the Deturbulator?